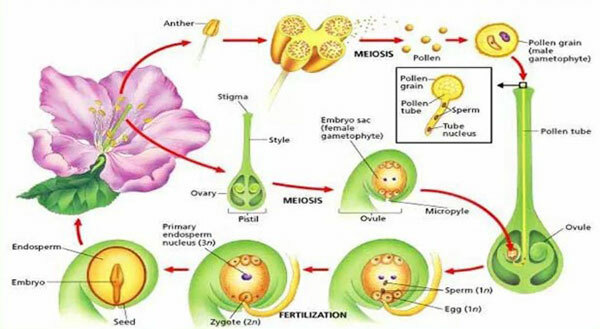 Double fertilization in angiosperms takes place by the pollen tube entering into the embryo sac, after entering it bursts and during this process one of the synergids is also destroyed. The tube nucleus disintegrates. One of the male gametes move towards the egg and the gamete and egg fuses with each other which is called syngamy and the other male gamete fuses with the secondary nucleus (triple fusion). This process is known as Double Fertilization. Double fertilization is the characteristics of angiosperms. The second synergid is destroyed after fertilization. The antipodal cells also disintegrate either before or after fertilization. After, fertilization the oospore develops into embryo while the endospermie nucleus develops into the endosperm. The development and formation of an embryo is termed as embryogenesis. Well, The fertilized oospore secretes a thick wall around it and is transformed into an Oospore which act as the first cell of the sporophytic generation. The oospore after undergoing a period of rest (few hours to few months) develops into an embryo. It divides immediately after the first division of the endosperm nucleus. The division of nucleus is always followed by wall formation. Early stages of development of monocot embryo of angiosperms and development of dicot embryo are the same but later stages show a marked difference. Here, we are mentioning the development of dicot embryo in angiosperms. 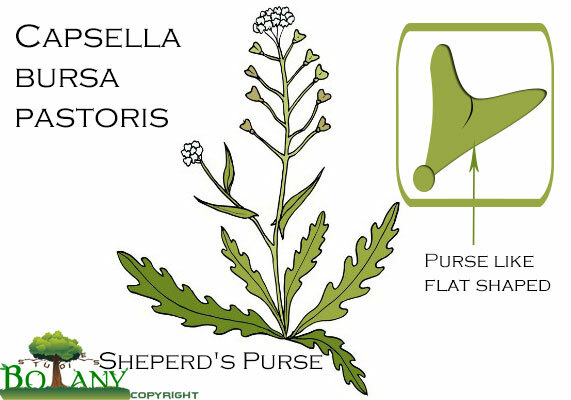 As an example, we are using the angiosperm plant called Sheperd’s Purse scientifically it is classified as Capsella bursa pastoris. The reason it is called sheperd’s purse because of the triangle shaped flat fruit. Its a small plant, annual and ruderal belongs to mustard family of brassicaceae. Development of dicot embryo starts by elongation and the embryo divides transversely into a Suspensor Cell (towards micropylar end) and an Embryo Cell directed towards the cavity of the embryo sac. The embryo cell enlarges and become spherical in outline. It divides by a vertical division into four cells. Two further division, one vertical and the other at right angles to the first one result in the formation of an octant (8 – celled embryo). This 8 – celled stage of the embryo is called Proembryo. The four octants next to the suspensor are the Hypobasal or Posterior Octants while the four octants towards the chalazal end are Epibasal or Anterior Octants. The epibasal octants give rise to Plumule and the Cotyledons whereas the hypobasal octants form the Hypocotyl (root end of the embryo). Now all the eight cells of the octant divide periclinally forming an Outer and Inner Layers of Cells. The cells of outer layer divide anticlinally forming a peripheral layer, the Dermatogen from which epidermis is formed. The cells of inner layer divide longitudinally and transversely forming the Periblem (ground tissue) beneath the dermatogen and Plerome (vascular tissue) in the center. The dermatogen is incomplete at the root end of the embryo, because the apex of the root is formed from hypophysis of the suspensor. The hypophysis divides transversely, the cell next to the embryo completes the periblem and the other cell undergoes two longitudinal divisions at right angles to each other forming a plate of four cells. Each of these four cells divide, the upper tier completes the dermatogen and the lower tier forms the root cap. As the growth progresses, the free end of embryo becomes heart shaped and lobed. Each lobe is a Cotyledon Primordium. The plumula and the epicotyl is produced in the depression between the two cotyledons. The plumula in dicots, is terminal. The cells of the lower end of the embryo forms Hypocotyl carrying radical at its tip. The suspensor cell divides transversely and produce 6-10 celled filament, the Suspensor. The suspensor pushes the embryo into the endosperm. The uppermost or distal cell of the suspensor is large and act as Haustorium, while the lowermost cell of the suspensor next to embroyonal cell is known as Hypophysis which by further divisions give rise to the Radicle (embryonic root).